If you are looking for a clean, classic design, this tile is for you. The Fleur de Lis is often used throughout history as a religious, political, dynastic, artistic, emblematic and symbolic design. 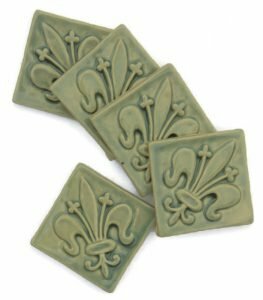 Regardless of the meaning that it carries for you, this attractive, simple Fleur de Lis 2 inch tile by Fire Creek Clay will add a touch of class to your tile project. We hand craft this tile from stoneware clay and fire it to almost 22o0 degrees for durability. You can install this tile indoors or out! We have plenty of glazes to choose from that will fit any décor. You don’t have to have the same tile that your neighbors do…make your home reflect you with custom, hand crafted tile. Click the Add to Cart button now to get the look of your dreams! The Fleur de Lis is often used throughout history as a religious, political, dynastic, artistic, emblematic and symbolic design. 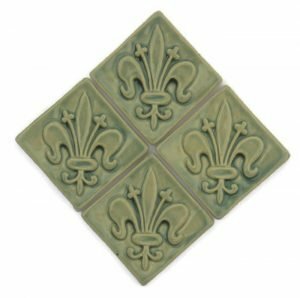 Regardless of the meaning that it carries for you, this attractive, simple Fleur de Lis 2 inch tile by Fire Creek Clay will add a touch of class to your tile project. Our tiles are 1/4 inch thick to compliment natural or commercial tile. Are you looking to complete the rustic, Old World feel? Use the Fleur de Lis tile with Fire Creek’s hand cut field tile. Hand cut from a slab of clay, hand carved and cast in plaster makes every tile unique. We hand craft every tile just for you! You can find our tile process HERE. Fire Creek fires every tile to almost 2200 degrees for durability. This beautiful tile is stunning, glazed in any of our 11 available glazes. Can’t find the right color? Please get in touch. Fire Creek is here to help you get the look you are dreaming of. Custom orders are always welcome. We craft our tile just for you! Please allow 4-6 weeks delivery.